I loved, loved, loved Crash into You! As soon as I started reading I was hooked. I found myself wanting to spend the whole day reading, and I jumped at every chance to sneak off, ignore my responsibilities, and immerse myself into Isaiah’s and Rachel’s story. For those who have read the first in the series, Pushing the Limits, you may have been rooting for Beth and Isaiah to get together. Well, it was never meant to be as *spoilers for those new to the series* Beth found her own dream guy in Dare You To. So, Beth and Isaiah shippers, will you be happy with this new girl Isaiah has found? I think you will! The characters are always superb in McGarry’s novels. Rachel Young was an awesome main character, although her family had a lot of problems. The older sister died and Rachel constantly feels pressurized to be exactly like her to please the mom. Rachel’s panic attacks doesn’t help anything either. Speaking of Rachel’s family, I suggest you pay close attention to the brothers, especially West! Not only is he a fun and full of attitude, West also has a whole book about him coming out in 2014! The romance is amazing. I loved the connection between Isaiah and Rachel even more than Noah and Echo! When you see the conversations the two have, you can tell they were meant for each other! Even though both characters lead completely different lives, they have this love for cars that initially drew them into one another, and then you see how they have a lot of fun together just hanging out. For anyone interested in car racing, this might be a pretty good book for you. I must confess I never had much interest (at all) in car racing. And, while I still have zero interest, McGarry made the scenes fun to read and carefully researched. Also, there is a lot of suspense over Rachel and Isaiah getting Eric, king of the streets, his money after one race turns into a disaster. The book revolves around this plot, and I really loved it; the plot kept me on my toes. We also get a good look at Abby, who is Rachel’s self-appointed BFF. Let me just say, you will enjoy every scene she is in! Overall, this book was such fun! 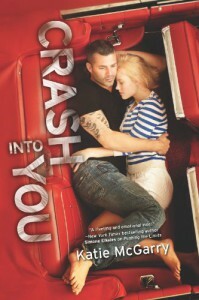 Crash Into You is my favorite McGarry book to date... and I really loved Pushing the Limits, so that’s saying something!